several hours, but intermittently. A number of animal models designed to study the effect of heat stress on the testis have been developed, and most studies include transient exposure of the testes to elevated temperatures (typically 43°C) or placing of the testes and epididymis within the body cavity (surgical inducing cryptorchidism) for long-term exposure of the testes to the core body temperature (37°C). Both methods have been reported to cause a variety of disturbances in testicular functions, including decreased testis weight, increased apoptosis, germ cell loss, and altered fertilization capability of sperm. These models are very useful for studying germ cell death and related molecular events, but it is necessary to pay attention when adopting the phenomena obtained from animal studies to human pathophysiology. Fig. 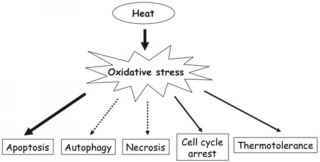 8.2 Relationships among temperature, extent of oxidative stress, and cell death. Ranges of apoptosis, autophagy, and necrosis indicated in the black square are based on published literature about nongerm cells. Of note, a prolonged duration of heat stress, even at 43°C, causes necrosis rather than apoptosis active (apoptosis), not passive (necrosis) cell death [31-33] . On the other hand, temperatures above 45°C or burns cause necrosis (Fig. 8.2), but it is likely that apoptosis and necrosis will concurrently occur at varying levels. From a clinical point of view, the mode of heat stress in vivo is quite different from experimental conditions. Most of the experimental conditions are specific for investigation of the effect of heat stress on each cell, including spermatogonia and mature sperm. In contrast, the deterioration of spermatogenesis in patients with cryptorchidism or varicocele is characterized by spermatogenic arrest at different levels, indicating that cell cycle arrest will mainly exist. Topics regarding germ cell apoptosis and cell cycle arrest are described in an independent section in this chapter. Fig. 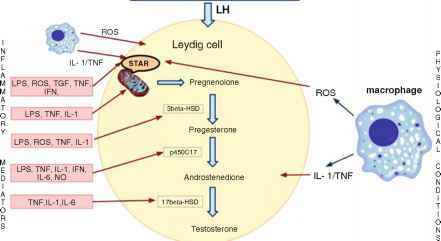 8.3 The expression of LC3-II proteins in 8-week-old Wistar rat testis exposed to heat stress (43°C, 15 min). Representative immunoblots from total testicular lysates are shown. LC3-I (18 kDa) is converted to LC3-II (16 kDa) during autophagy induction. The apparent intensity of the LC3-II band indicates that the testis undergoes apparent basal autophagy under normal conditions. 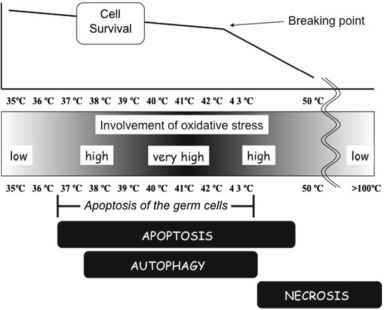 Maximum induction of autophagy is observed 1 h after heat stress. All animal experiments followed a protocol approved by the Ethics Committee on Animal Experiments from the Yamaguchi University School of Medicine and were performed according to the Guidelines for Animal Experiments of the Committee undergoes proteolytic cleavage followed by lipid modification and is converted to the 16-kDa membrane-bound form (LC3B-II), which is specifically localized to the autophagosomal membranes. The conversion from LC3B-I to LC3B-II is used as a sensitive marker for autophagy in cells. The temperature spectrum for autophagy shown in Fig. 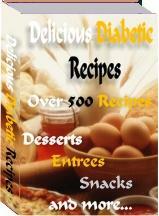 8.2 is based on the results of studies in nongerm cells. Figure 8.3 illustrates the presence of heat-induced autophagy in rat testis (unpublished data). Testes of 8-week-old Wistar rats were immersed in water at 43°C for 15 min under sodium pentobarbital anesthesia. The cleavage of LC3B-I to 16-kDa fragments was examined. Whole testicular lysate was electrophoresed and immu-noblotted with anti-LC3 antibodies. There is basal autophagy in the normal testis and increased expression of 16-kDa LC3 fragments, indicating that heat stress induces autophagy in the testis, but localization of autophagy has not been identified. Autophagic cell death is reported to play an important role in the preimplanta-tion embryo  . The involvement of autophagy has not been defined in further detail, but is considered to play important roles in normal spermatogenesis and heat-induced conditions.